The gain in weight is obvious. It's obvious when you accelerate, and it is obvious when you brake. But it's most conspicuous when you turn a corner. Not that the two-wheel drive Force One, or the SX, is an outstanding handler to begin with, but given its almost two-tonne kerb weight and a ladder frame chassis, the SX, somehow, isn't exactly hairy or clueless around a tightening bend. 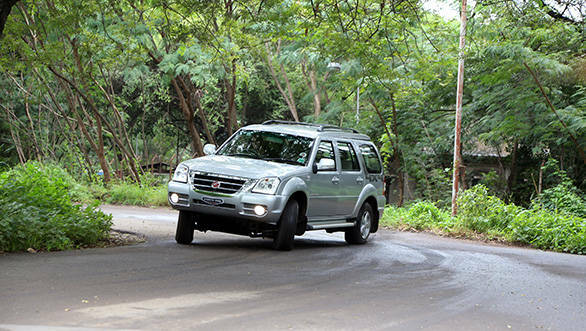 Yes, it rolls, and yes, its front tyres struggle to grip around a bend, but for an old school SUV, it is more than manageable. The same, however, cannot be said about the recently launched Force One LX. 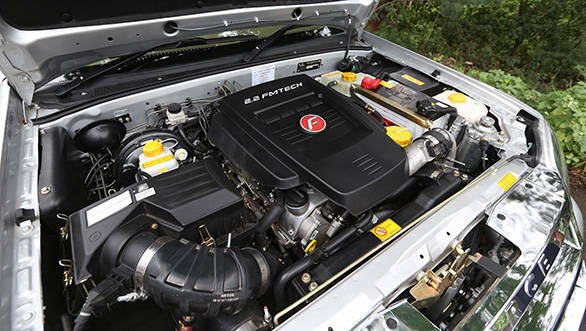 The LX is One's 4x4 avatar, which has gained another 200kg. The weight distribution has changed, and although Force Motors has revised the spring and damper ratings for the suspension to handle the extra weight, the company has steered away from getting Lotus Engineering's help to sort out the dynamics. Lotus, as our regular readers would be aware, had tuned the ride and handling characteristics of the two-wheel drive Force One. 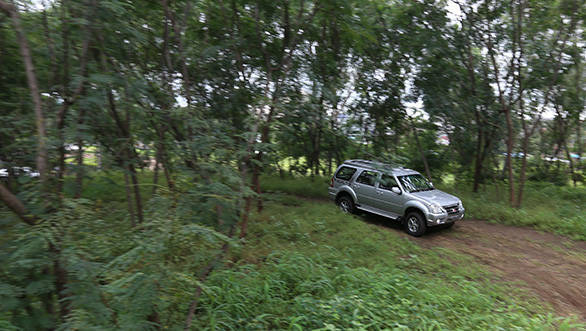 Now we only got the Force One 4x4 for a short drive around Force's test track at Akurdi, Pune. The track has one straight and a couple of corners, besides some scientifically designed broken sections. 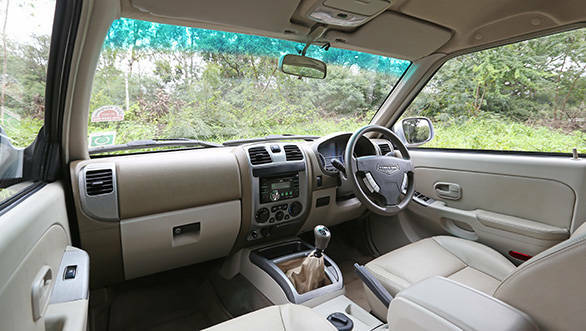 We first chose to stick to regular tarmac, and because the LX gets 4x4, we also trotted up the off-roading bit meant specifically for the Force Gurkha. Compared to the rear-wheel drive SX, the LX feels heavier footed. Its responses to throttle inputs are lazier, and it also takes longer to get up to speed. Even under braking, one needs more pedal pressure to slow the LX down, and even under emergency braking, it takes longer to come to complete stop. There's no getting away from momentum, I guess. The steering response surprisingly is still good - it's not overtly heavy or vague, something we have come to expect of old school body-on-ladder frame SUVs. But the LX rolls excessively turning into corners. First the front struggles to grip, and then when you get on the power to compensate for the understeer, the rear comes around. The good news is because the LX uses a limited slip differential, oversteer on the LX is quite easy to control, even though it does feel like you are drifting a school bus. This is all when driven in two-wheel drive mode, mind you. In four-wheel drive or four-wheel low, both of which can be accessed by simply turning a knob on the central tunnel, the handling deteriorates further. The SUV, in both these modes, needs more room to go around, and the turning into bends is seriously compromised. It's best then to shift to four-wheel drive when you most need it, like when driving though slush or when tackling a steep rocky or sandy incline. And in both these conditions, we think the Low setting works best. 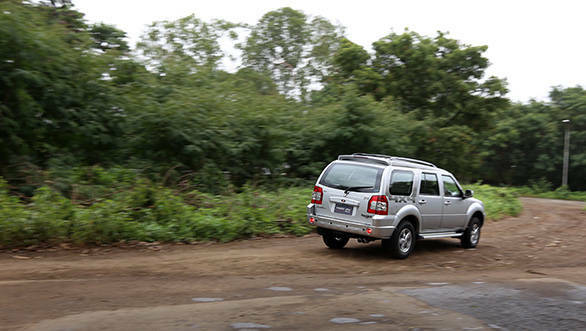 It does drop the One's top speed to 65kmph, but when we took the SUV onto the off-roading track with Low engaged, it had us floored. The One would climb any gradient, it would plough itself out of any slush, and though its humongous wheelbase of over 3000mm makes it a cumbersome machine at times to off-road with, the point is, it can. In all other areas, the SX and LX are identical. There's no real visual differentiation apart from some 4x4 badging on the LX and a seriously big sump guard. Even on the inside, the equipment levels are identical. So, both get AC vents for all three rows, a stereo system with Bluetooth telephony, decent storage in and around the central tunnel, and leather upholstery. There's also ABS and two airbags. So, buy the 4x4 only if you are going to get stuck often. Otherwise, no matter how high the bragging rights of owning a 4x4, on the Force One, the SX is the trim to opt for.